Complimentary shuttle service will be provided from the Sheraton Hotel to the Price Center, but if you choose to park on campus, the following options are available: We have reserved a limited number of parking spaces at the Gilman parking structure that are available on a first come first served basis. If all the spaces are taken, parking is available for $8/day in the Regents Parking Lot (P703/P705). 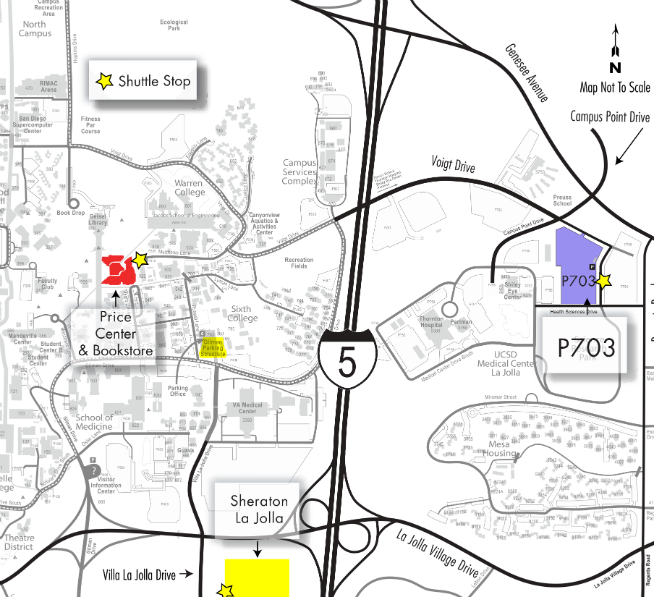 On Sunday, parking is available in lot P602 for free. On Monday and Tuesday, parking is available for $8/day in the Regents Parking Lot (P703/P705). There is a shuttle available as well near the pay station which will take you to the Price Center. Take the East & Regents shuttle to the Price Center (there is a green "P" on the front of the bus).